President John F. Kennedy and first lady Jackie Kennedy, with Texas Gov. John Connally, on Nov. 22, 1963, the day the president was assassinated. Perhaps no major event in modern U.S. history has spawned more widespread doubt than the assassination of President John F. Kennedy in Dallas in November 1963. The official account: One man, Lee Harvey Oswald, did it. The unofficial theory: Well, there are many. The JFK assassination is back in the news as the deadline for releasing a final batch of government documents related to the investigation approaches. Back in 1992, Congress passed a law ordering that all remaining papers be released by Oct. 26, 2017 — that’s this Thursday. President Trump could still decide to keep some information secret on national security grounds, but he seems inclined to allow everything to be released on schedule. Will this last dossier of evidence put the conspiracy theories to rest? That’s unlikely. Despite plenty of evidence to the contrary, most Americans have believed that more than one person was involved in Kennedy’s death since almost the moment of the assassination. According to a new FiveThirtyEight-commissioned SurveyMonkey poll of 5,130 adults, conducted Oct. 17 to Oct. 20, 2017, only 33 percent of Americans believe that one man was responsible for the assassination. A majority, 61 percent, think that others were involved in a conspiracy. In pretty much every demographic, most respondents believed that Oswald didn’t act alone. A majority of men, women, white people, people of color, registered voters, non-registered voters, old people, young people, Democrats, Republicans and so on all believe that more than one person was involved in Kennedy’s assassination. This is one of the few questions in this polarized age on which you can even find agreement among Hillary Clinton voters (59 percent believe in a conspiracy) and Trump voters (61 percent). That’s not say that every group believes in a conspiracy theory at equal rates. African-Americans (76 percent) and Hispanics (72 percent) are far more likely than whites (56 percent) to believe that Oswald didn’t act alone. The government, of course, has a history of lying to the black community, which may be why African-Americans are more likely to think the government isn’t telling the whole story about Kennedy’s death and other major news stories. Additionally, independents who don’t lean toward either party (70 percent) and people who aren’t registered to vote (69 percent) are also more likely to believe there was a conspiracy. Again, that’s not surprising: If you don’t trust government, research has found that you’re more likely to not care who runs it and to not claim membership in one of the parties who control it. Despite the low percentage of Americans who believe the government line, the theory that Oswald acted alone has actually gained steam among the public in recent years. In our SurveyMonkey poll, the 33 percent of people who believe that one man killed Kennedy is higher than it’s been in any yearly average of polling since 1966. That was the year before New Orleans District Attorney Jim Garrison publicly accused the government of enacting a huge cover-up to conceal the fact that the president had been killed by anti-Communist extremists in the CIA. He later prosecuted a man he believed was involved in the conspiracy, and though he lost his conspiracy case in court, Garrison and his theory went on to be immortalized in Oliver Stone’s 1991 film “JFK.” Although the movie made millions of dollars and fanned the flames of conspiracy, it did not seem to have much impact on American opinion overall — the percentage of Americans who believed in a conspiracy remained pretty stable before and after the film’s release. Why is it, though, that belief in a lone gunman has grown by over 20 percentage points in the past two decades? It could be that conspiracy theorists’ inability to provide proof has hurt their appeal to the public. It’s also possible that recent computerized evidence seeming to prove Oswald acted alone has gotten through to Americans. Finally, it could be a simple matter of demographic changes. The percentage of Americans who have at least a college degree continues to rise, and SurveyMonkey found that 42 percent of Americans with at least a college degree believed Oswald acted alone compared to 29 percent with less than a college degree.1 In fact, a slight plurality of whites with at least a college degree actually believed one man was responsible for the death of Kennedy. 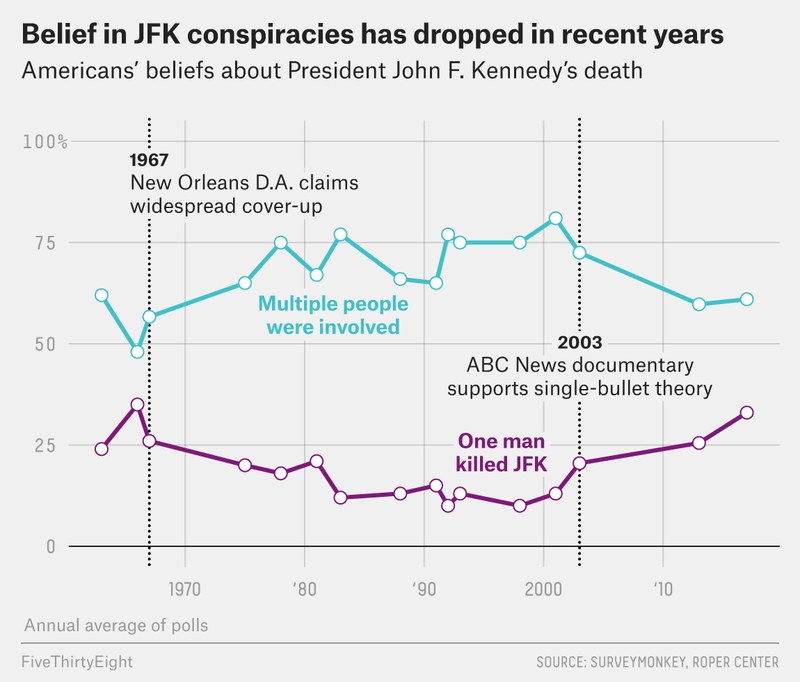 Whatever the cause of the recent upswing in the popularity of the lone assassin theory, most Americans still think that there was a conspiracy and that more than one man was responsible for Kennedy’s death. Perhaps if the government releases the final documents on the assassination, that will put conspiracy theories about the murder to rest. But chances are it won’t. Indeed, people with higher education levels are the least likely to believe in conspiracy theories in general.